Based in Berkeley, California, THE GHOST NEXT DOOR emerged from a desire to marry the dark melancholy of 80’s and 90’s alternative with the aggression and drive of Bay Area metal. 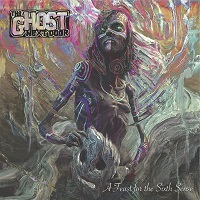 With Gary Wendt on guitar and vocals, Aaron Asghari on guitar, Noah Whitfield on bass, and Sebastien Castelain on drums, solid songwriting and musical diversity are at the core of THE GHOST NEXT DOOR’s sound. Each member brings unique influences from across the modern music spectrum: from Punk to Jazz, Progressive Metal to Sadcore, Modern Rock to Thrash. Their influences and playing styles combine into meter-bending, riff-driven rock & roll breaking out from under the bare skin of abrasively honest lyrics. On stage, they come together to show what manifests from an undeniable compulsion to create and perform their expressive take on modern metal. “A Feast for the Sixth Sense” contains ten tracks. “Deadworld” leads off the album, with a dark and slow guitar riff marked by an odd meter. The vocals are depressive, sung low in the first verse and a bit higher in the second verse. There is a crushing weight to the sound that is subdued. Sadcore. I think I understand what it means now and how it takes shape into a song. “Fodder for the Meat Grinder” is a bit quicker and has a dissonance between the notes in the guitars and the vocals. It’s purposeful I’m sure, but doesn’t right itself until the chorus. Unexpectedly a melodic passage emerges in the vein of KING’s X, and then it’s back to that earlier sound. “Doubt” opens with a bit of melody in the guitar work and a slow, grinding pace. The music is just dejected and void of hope, while the vocals go from melancholy to angry at the drop of a dime. Following yet another little interlude, it returns to the crushing weight of the earlier track. “Event Horizon” opens with a slow set of drums and a despondent riff that leads to an introspective melodic section that is high with emotions. At times this borders on the Doom genre, but they never fully commit. Wendt stretches out at times to get his point across, but I love the clean guitar passages and the void that they bring in the song. “American Nightmare” is a more straightforward song with a heavy riff and angry vocals. “He will take your faith in God and rip it from your heart” is one line that stuck with me. The music pulsates with energy even know the lyrics are dark as hell. “Behind the Mask” has a slow, dark groove, and a steady rhythm throughout. “LCD” opens with clean guitar notes and a bit of melody. Once it gets going, it’s a heavy slab that weighs your heart down like being tagged with chains of cinder blocks and being dropped in the water. “I Am Become Death” opens with bass guitar slowly walking back and forth. The vocals taunt you, saying “I will free you from sorrow, I will free you from all of your pain.” Some melody gives you hope, but the message is the opposite. “The Sacrifice Person” opens with monotone vocals, repeating the same line four times. The sound is dark and melancholy, presenting a slow death like Chinese water torture. “Stop Here on Red” closes the album. It opens with a slow psychedelic guitar part and leads to a trippy grind with angry vocals. The chorus however is very sterile and even-keeled. It feels like it is coming from a different world. I have to say, if you are a music aficionado and think you’ve heard it all before, you haven’t, and this is for you. It has an old school feeling to it to some degree, but also a very modern feel. The feelings they are able to convey through their music might be some of the most dejected, lonely and hopeless feelings that I have ever felt. It’s brilliant in that regard. Good music should move you, whether happy or sad, and this moved me for sure. Take a listen please.